Qatar’s Emir Sheikh Tamim bin Hamad al-Thani and his host Macky Sall oversaw signing of a series Memorandums of Understanding (MoU) between the two countries as the Qatar leader seeks to expand the international influence of the emirate and break Saudi Arabia’s and its allies influence on the African continent. Emir Tamim arrived Wednesday in the Senegal capital six months after Dakar severed ties with Qatar. Saudi Arabia, United Arab Emirates (UAE), Bahrain and Egypt on June 5 cut off relations with Qatar accusing it of sponsoring terrorism. Senegal and a number of African countries joined the quartet reducing ties with gas-rich emirate. President Sall recalled his ambassador Doha. The West African country in August after a telephone between their two leaders re-established ties, with President Sall sending back his envoy. The MoUs include cultural co-operation agreement, a memorandum of understanding for co-operation in field of sports and another on co-operation in the field of youth, reports say. 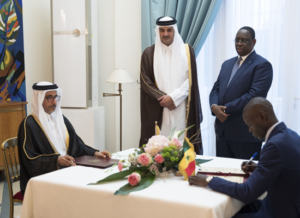 Qatar and Senegal have recently scaled up diplomatic and economic relations. The Qatari leader supported Senegal to host the International Organization of la Francophonie summit in Dakar in 2015. Emir Tamim after the Senegal leg stop will also visit Mali, Guinea Conakry, Cote d’Ivoire, Burkina Faso and Ghana. The young leader will announce Qatar’s contribution for the construction of a hospital for cancer in Burkina Faso. The contribution is estimated at $13.8 million.